Season the pork as desired then rub with the cumin. Place the pork into a 4-quart slow cooker. Cover and cook on HIGH for 5 to 6 hours or until the pork is fork-tender. Remove the pork to a cutting board. Using 2 forks, shred the pork. Heat the oven to 350°F. 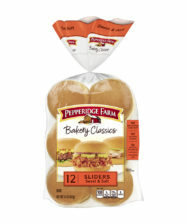 Place 1 slice ham onto each bottom bun half. Top each with about 1/4 cup pork, 1 slice cheese and 2 pickle chips. Spread the mustard on the top bun halves and place on top. 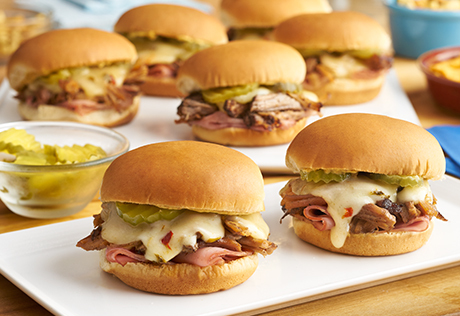 Place the sliders onto a baking sheet. Brush the tops of the sliders with the butter, if desired. Cover the sliders with aluminum foil (tent the foil by leaving space between the tops of the buns and the foil and crimping the edges of the foil to the long sides of the baking sheet to hold in place).